In this article I am going to explain about how to add desktop shortcut icon through group policy. 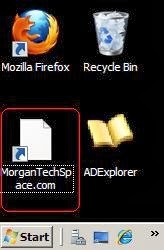 This is a very common task in any domain environment for either all of your user’s computer or to a certain group of user’s computer depending on your needs. 4. Now Right-click on the newly created gpo shorcut-policy and click edit. 5. In the Group Policy Management Editor window, expand User Configuration and go to the node Shortcuts (User Configuration/Preferences/Windows Settings/Shortcuts). 6. Right-click in the white empty area, select New and then select Shortcut. 8. Click on the Common tab. Select Remove this item when it is no longer applied and select OK to the prompt about changing the Action field to ‘Replace’.What this will do is remove the icon if we delete this policy, or if the user falls out of the OU structure that has this policy applied to it. 9. In the Description field, write the description as easy way to understand what is this policy, click Apply, and OK.
Howdy, I do believe your web site could be having internet browser compatibility problems. This worked perfectly, thanks for the info. I've worked hard on.Any suggestions? How do you manage the security of the shortcut? Like making it read & execute to everybody except the admins? Yes! Finally something about research paper.